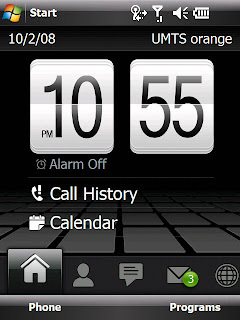 This is a new project I'm working on in my spear time, the great XDA Developers have extracted the so called TouchFlo2d from a HTC device and they ported it over other HTC and now even Non HTC devices so you can use the great interface on your windows mobile devices to impress people :) or for any other reason, anyway because the original interface is for QVGA devices I started to port it over to VGA devices too (as mine is VGA) and created a thread on the XDA forum for updates and fixes please go there and don't forget to thank the TouchFlo2d developers for bringing this to our devices. 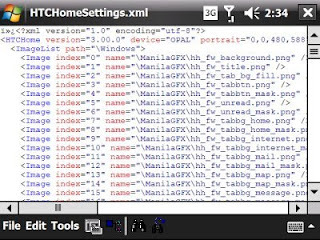 This screen shot was taken on my X7510 device as you can see almost all of the images have been redone so the quality looks good (at least I hope so) there are still some bugs that need to be fixed but till now it work pretty well. Helps is always welcome as I do this in my free time (which isn't much) so if you think you can help me with something just drop me a letter or im. CEdit is the best source editor for windows mobile devices available (correct me if I'm wrong) but unfortunately it is not compatible with the latest windows mobile 6.1 devices. It works just fine but even if you buy the license you won't be able to register it as the registration window won't show up so you are out of luck to use it for more than 15 days. Now I had a talk with the developer "Tim Kingsbury" who is a very nice guy, he said that unfortunately he has a lot of work on other projects but will try to find a fix for this one too, unfortunately he wasn't able to work on this lately so he kindly refunded my registration fee (which as I told him wasn't necessary so he is a very correct man) but the sad part is that I still can't use the program as it simply won't let me after 15 days so I wrote a little crack that enables to use the program to be used without registration this way you can use it on your Windows Mobile 6.1 device BUT please DON'T ask me for the crack instead please go to the CEdit's page and buy the program so we can motivate "Logical Sky" to update the build for the latest devices and we support them too as it's really a must have program for those who have to do some little codings/fixings while on road, thats for sure!